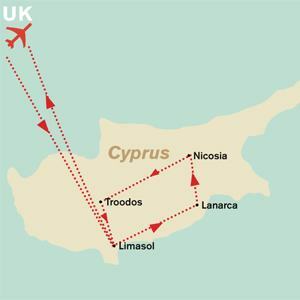 Meet your Tour Director at the dedicated UK airport and receive your ticket to board your flight to Limassol. Upon arrival you will be transferred to your luxurious Beach side Resort. The rest of the day is free at leisure. Today you enjoy a full day tour to Larnaca, a town with strong links to the past. In the heart one finds remains of the ancient city-kingdom of Kition, reminiscent of its glorious day. Larnaca has a splendid Palm Trees Promenade, an old fort and unique old charters. Visit the St Lazarus Church, the Hala Sultan Tekke, the tomb of Umm Haram, allegedly a relative of Prophet Mohammed, finally a visit to the "Church built by Angels", an 11th century Byzantine church that was erected over the ruins of an Early Christian basilica. Today you are free to explore the fascinating town of Limassol, or why not try your hand at some of the many water sports activities available. Tonight enjoy a Folklore Night with Show & Band. This evening you go to a typical Cypriot Tavern and enjoy an informal meze meal where guests are served with various different local specialty dishes accompanied by local village wine. There will be a traditional Cypriot folkloric evening with a live band and a show consisting of dancers who will perform both Cypriot and Greek dances in local costumes. Audience participation is a must on this evening out, with guests being taught the steps to Cypriot dances. Today you drive to the capital, which is a definite must, Nicosia is unique in that it is the only remaining divided capital in the world today. The contrast of the old and new is most evident, with its modern and international shops and showrooms lining the city boulevards such as the famous Makarios Avenue, to the cobbled streets and open-air cafes of Laiki Yitonia. The old quarters of Nicosia have been renovated to evoke the atmosphere of the old city. You will also find some of the best museums in Cyprus, housing important collections of Cypriot antiquities and art treasures. Today you are free to relax by the beach or poolside. Those who feel like being more active could perhaps join a short cruise along the spectacular coastline. This morning enjoy a full day optional. Professional jeep drivers will pick us up from the hotel, and drive you to the picturesque village of Omodhos. On your way, you visit the ancient monuments and taste some "Commandaria" a typical dessert wine. Later you visit the various traditional workshops constructing hand made baskets, making halloumi cheese & pottery. You will then visit the village church "Holy Cross" and the traditional folkloric museum of "Socrates". This day you have a free day to relax by the poolside or to shop at this wonderful sea-side resort. This morning you have some free time before being transferred to the airport for your return flight home.